Its not surprising that praline- a mixture of nuts and sugar syrup are so popular in desserts nowadays? It’s no longer the usual “chocolate cake”you see but rather Chocolate Praline cake or something along the line like“chocolate cakes with praline insert and mousse”. There is something about this word that excites me. And I believe that you- dessert fanatics out there would also nod your head in agreement. 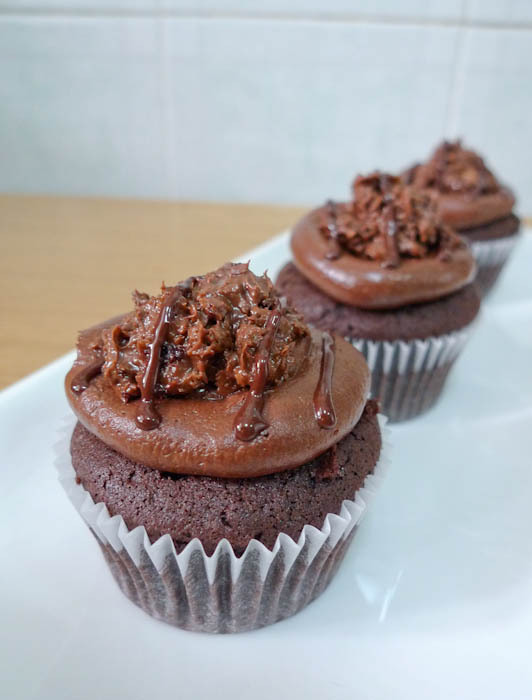 Baked with Love: Chocolate fudge cupcakes with chocolate ganache and praline. The nuts I used in the making of the praline were pecans and hazelnuts (The 2 nuts in the nutty family that I love very much).